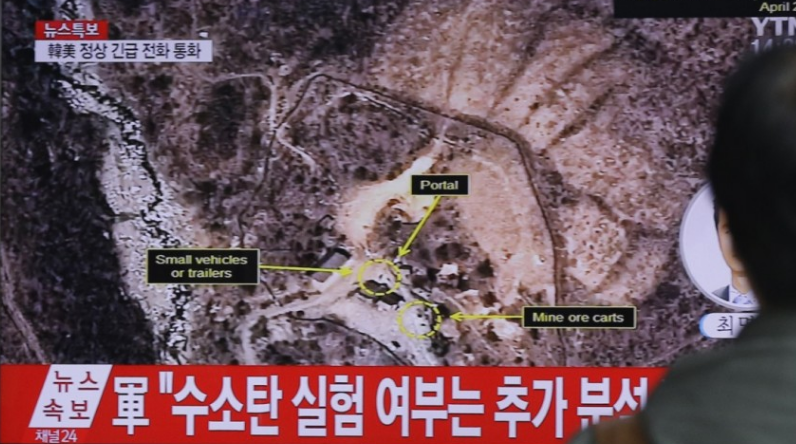 Some countries (read: North Korea) conduct nuclear explosions deep within a mountain. Tunnels are drilled (by political prisoners housed in concentration camps) deep into a mountain to prevent radiation reaching the surface. The North Korean Punggye-ri site comprises a number of tunnel complexes. Five nuclear explosions have been conducted in a tunnel complex to the north of the support area, under Mount Mantap. Now, scientists are worried that the entire mountain might collapse in on itself and release a cloud of radiation onto the surrounding area. Satellite images captured during North Korea's test of a nuclear bomb in September 2017, Mount Mantap could be seen visibly subsided during the explosion, an indication of both the size of the blast and the weakness of the mountain. The enormous detonation which triggered a 6.3 magnitude earthquake in northeastern North Korea. And since that test, the region - which is not known for seismic activity - has experienced several landslides and no fewer than three more earthquakes. The tremors even shook homes in southeastern China. And eight minutes after the initial quake subsided, there was a 4.1-magnitude earthquake that appeared to be a tunnel collapsing at the site. Scientists call this the Tired Mountain Syndrome. Mount Mantap is possibly weakened to the point of collapsing in on itself. But perhaps equally as concerning as the collapse of Mantap is the possibility that another test could trigger an eruption at Mount Paektu, an active supervolcano located on the North Korea-China border, about 80 miles from Pyungge-ri.